Drive pinion maintenance & inspections can often be neglected by the maintenance department, not intentional of course, it’s just often overlooked. 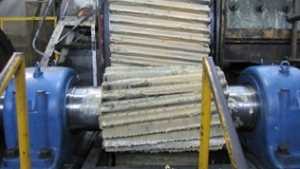 This can cause unexpected and unnecessary mill down time due to failure, excessive wear or a combination of both. In some cases critical spares such as the pinion are not held in store which could lead to lengthy down time due to delivery lead times. Can you afford to have your mill silent for weeks on end? You have no doubt heard the old saying that ‘prevention is better than a cure.’ Well, the same can be said for maintenance practices for the open gear drive of any mill. Fixed Plant Maintenance Solutions (FPMS) has the capabilities to carry out routine inspections, Preventative Maintenance (PM) schedules and on-site repairs, be it a pinion bearing change, reversal or installation of a new item. In addition, we can offer recommendation’s on appropriate lubricants and make corrections for temperature misalignment across the pinion which can be caused by wear etc. Acting on these recommendations will ensure greater reliability from your equipment – which in turn means greatly reduced down times. In addition to this, FPMS is solely independent of any of the OEM’s. This means that FPMS can provide you with an unbiased opinion or recommendation of suppliers for replacement equipment or supply of new equipment. Don’t delay any longer… contact FPMS to discuss how we can help you maintain your assets effectively. Email brentd@fixedplantms.com.au.